A new image taken by a NASA satellite captures the extent of a major oil spill triggered by the explosion aboard an offshore oil rig about 40 miles off the Louisiana coast in the Gulf of Mexico. An estimated 42,000 gallons of oil have been gushing into Gulf waters daily since the Deepwater Horizon exploded and sank to the sea floor last week. 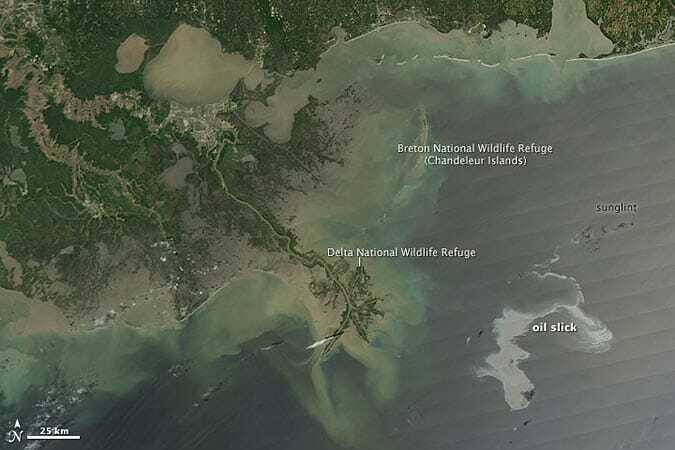 Eleven crew members were killed in the blast, and several others were injured, and experts say the spill threatens the marine environment across the region, particularly on the Chandeleur and Breton barrier islands in Louisiana, where thousands of birds are nesting. Oyster beds on the eastern edge of the Mississippi River also are threatened. In this image, taken by NASA’s Aqua satellite, the swirling sheen of oil — roughly 50 miles long and 33 miles wide — is seen in the lower right corner. Northerly winds have blown the slick away from the coast, but the wind direction is expected to shift Thursday and drive the slick toward the Louisiana wetlands. BP, the company that owns the platform, is using robotic submarines to try to seal the leaking oil well. The oil well spewing crude into the Gulf of Mexico didn’t have a remote-control shut-off switch used in two other major oil-producing nations as last-resort protection against underwater spills. U.S. regulators don’t mandate use of the remote-control device on offshore rigs, and the Deepwater Horizon, hired by oil giant BP PLC, didn’t have one. With the remote control, a crew can attempt to trigger an underwater valve that shuts down the well even if the oil rig itself is damaged or evacuated. The Gulf of Mexico oil spill could be leaking at a rate of 25,000 barrels [over 1 million gallons] a day, five times the government’s current estimate, industry experts say. Basing their calculations on government data and standard industry measurement tools, the experts said the Gulf spill may already rival the historic 1969 Santa Barbara, Calif., and 1989 Exxon Valdez disasters. Ian MacDonald, professor of oceanography at Florida State University who specializes in tracking ocean oil seeps from satellite imagery, said there may already be more than 9 million gallons of oil floating in the Gulf now, based on his estimate of a 25,000 barrel-a-day leak rate. That’s compared to 12 million gallons spilled in the Valdez accident. Interior Department officials said it may take 90 days to cap the leaking well. If the 25,000 barrels a day is accurate and it leaks for 90 days, that’s 2.25 million barrels or 94.5 million gallons. Mr. MacDonald and his colleagues at the Earth, Ocean and Atmospheric Science Department have worked jointly with National Oceanic and Atmospheric Administration in the past on oil spill tracking, and have shared their estimates with NOAA scientists. He said the NOAA scientists didn’t dispute the calculations. Another worker familiar with the rig told the lawyers that the company had chosen not to install a deep-water valve that would have been placed about 200 feet under the sea floor. Much like blowout preventers, devices that are meant to seal leaks, this valve could have served as a cutoff of last resort in explosions, the lawyers said. “The company took their chances in not having the valve so they could save money,” said Mike Papantonio, one of the lawyers representing the shrimpers and fishermen. Mr. Gowers [a BP spokesman] declined to comment on that claim except to say that the investigation was continuing and that it was too early to speculate. And if we’re not that lucky? We expect that the Federal Reserve will extend the timeframe that we have come to know as the “extended period” in the making of its monetary policy. We do not expect the Fed to raise interest rates at all for the rest of this year, and maybe well into next year. We expect to see the deterioration of the economic statistics for the US to reveal the onset of this oil-slick crisis in May, and the negative impact will intensify during the summer months. A “double-dip” recession probably has been made more likely by this tragedy. Would any free market supporters like to defend this thinly veiled example of corporate welfare? Ms Margonelli notes that the Gulf disaster will likely lead to calls for a ban on new offshore drilling, and that this ultimately won’t accomplish very much. Demand for oil will remain high, and so the drilling, pumping, and transport of oil will continue. While Americans (and much of the world’s citizens) remain hungry for fossil fuels, a supply-side solution to the problem of negative fossil fuel externalities—environmental and human disasters, foreign policy complications, and the looming catastrophe of global warming—is unlikely to do much good. What would do some good would be an effort to limit oil demand, and the most direct way to accomplish that is to tax the stuff. America notably has one of the lowest national petrol tax rates of any developed nation. The rate was last increased in 1993, and its value has eroded significantly since then, in real terms and relative to the market price of oil. It’s an absurd state of affairs given America’s dependence on oil. It’s more ridiculous still when one considers that the federal government has been running short of funds to pay for and maintain its highways for years, and the federal highway trust fund is basically dry. America can’t afford its infrastructure. Yes that’s right, it must have been those environmentalists that caused the spill. Because that makes sense… craziness like this can only come from people completely divorced from reality. The ability to drill a relief well in the same season is especially important in the Arctic, where thickening ice typically forces a halt to all drilling by December. If a relief well can’t be completed by then, oil could continue to leak into the ocean for months – possibly years – until the problem is fixed. But a group of major companies has argued that new deep-water exploration areas in the Beaufort Sea require wells that will take two or three years to drill – making a same-season relief well impossible. They have also said that new technology has made drilling so safe that relief wells are no longer needed – and that, in any case, they are rarely the right tool in an emergency. The latter argument has, however, come into question now that BP PLC has said a relief well is one of the top options to stop oil flowing from the well the Deepwater Horizon was drilling, and some believe the explosion will derail that request entirely. This spill highlights the oft ignored reality that oil drilling is neither easy, nor safe, despite the fact that it has become easier and safer, and someone needs to be prepared to deal with the inevitable disaster both financially and ecologically. It represents nothing sort of corporate welfare to force taxpayers to foot the bill. But there is a wider point to be considered here. The offshore drilling industry is currently undergoing a transition. Most easy targets have already been developed, and yet global demand for oil is not abating. In an attempt to quench this thirst, attention is moving into more technically challenging areas, with more complex geology and often in the deeper waters of the outer continental shelf. The increasing complexity of the equipment required to drill in such areas increases the number of things that can go wrong, and the location of the drilling makes dealing with catastrophic failures much more difficult, as we are seeing all too clearly this week. *this ignores, of course, what has been recently pointed out by Lab Lemming, and Lisa Margonelli in the New York Times: that major spills have been regularly occurring – and largely ignored by the developed world – in places like Nigeria. The fact that oil companies have such a poor record in places unlikely to be touched by Western media and public outrage does not instil much confidence in the idea of self-regulation. Drilling technology might have gotten better, but the easily accessible oil is running out. What is left is oil located in difficult to access places where there is much more that can go wrong. And when it goes wrong, fixing it becomes an incredible challenge, one that we may not be able to overcome. Commentators call it an “oil spill” That means people will think of the oil as limited to only one tankerfull. 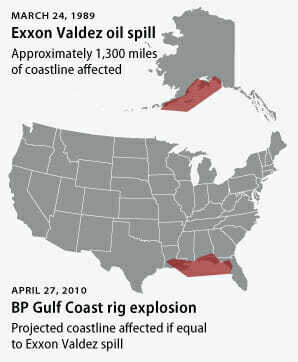 It is not just a spill, it is an entire oil well released and spurting from a very deep part of the bottom of the Gulf. The oil will spurt up forever or until it is capped by a very difficult and dangerous deepwater operation with submarines and heavy remote controlled equipment. In the USA news this is not being explained. Booms and sprinkling dispersants (soap) are a foolish gesture and will let oil slicks dissolve and contaminate the water and sea life not just float on top and contaminate only boats and marsh nesting grounds of migrating birds and merely blacken shores and beaches by daily expanding hundreds of miles of sticky lingering layers. False remedies like soap help governments put off expensive true remedies like capping the deep oil well. USA journalists should warn about the size of the danger. Good point, this isn’t a spill in the usual sense. But I am not sure that dispersant’s are a bad idea. My notion is that by breaking up the oil it will be far less damaging to marine life (especially marine mammals that must come to the surface to breathe). But my knowledge is limited. Also it was my understanding that attempts are being made to cap the well.